The InterOceanic Highway, completed in 2011, running from the Atlantic coast of Brazil to the Pacific coast of Peru. I’ve been thinking of you all during my travels, and thought that I would describe a bit of the journey to date to share. 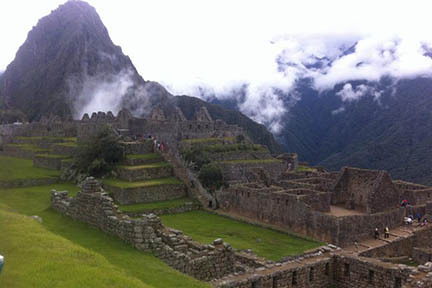 The class officially began with the student’s arrival in Lima in the evening of May 13. After a few days in Lima for orientation, and a trip to Machu Picchu and immersion in Incan civilization and history, we headed to the high Andes for field work and exploration, and I’ll start the story there. The high Andes is indeed high; we spend much of our time 13,000-15,000 feet above sea level (for reference, Denver sits at 5,000 ft asl). The air is thin, the temperatures are cool, and the air is extraordinarily dry. The quality of the light is striking; clear, bright, making the edges of everything sharp and distinct (the view of the Ausangate Glacier on a sunny day will almost blind you). Most women that you see wear the traditional clothing: sandals, layers of gathered skirts with the outermost one of black that is highly embroidered, sweaters or a decorated short jacket, a hat that is distinctive of their community or region (e.g., tall felt hats, circular flat ones with a fringe of color that indicates martial status, embroidered and decorated), and finally the brightly colored, woven blanket that is fashioned into a backpack of sorts and tied in the front, that carries anything from babies and toddlers to bundles of grass for the ubiquitous guinea pigs that they raise in their homes for food (termed cuy). They often are spinning alpaca wool as they walk, their fingers moving so deftly and quickly that you barely detect movement. Men wear sandals, short black pants, a woven jacket or poncho, and often the knitted and decorated Andean hat with pompoms at the end of the chin ties. The colors of the Andes are the most true and clear red, accompanied by yellow, orange, green, and blue. Everything is made primarily of alpaca and wool, and lovely natural colors because of the organic dyes. Art is mainly in the form of woven textiles, which are proudly and obviously worn and used. The language is primarily quechua, the language of the Incas; it was originally not a written language, and is full of many hard “ch” and “k” sounds. For the foodies that I know, the obvious thing to talk about is the potatoes. Estimates of the varieties of potatoes grown in the Andes varies, but somewhere in the range of 3000-5000 is not a stretch; six communities that have banded together to form the Parque de Papas (Potato Park) grow 1700 varieties alone. My favorite is the Qhuchan Waguchi, aka the potato-that-makes-the-daughter-in-law-cry, or the Mother-in-law-potato; it looks to be a formation of small bumps, and the worthiness of a young woman as a marital prospect is assessed on the basis of how quickly and well she can peel the potato. In comparison, the translation of the name for the white potato that we eat is “bland and insipid”. We have our students do a scavenger hunt in the market in Cusco, and one of the items is always a count of the number of varieties of potato; this year’s number was 57. The variations in texture and taste spoil you as a potato-eater forever. However, I still can’t answer my Dad’s only question, “Which is the best for potato pancakes?”. Perhaps the Qhuchan Waguchi? Additional local culinary delights include alpaca, trout (framed in Andean lakes) and Quenhua. Quenhua, grown in the Andes from Colombia to Chile, exploded on the world market a few years ago due to its high nutritional value. This grain is found in many foods from breads to soups and stews. Just this past March we found out from our driver that 10 years ago they fed it to their chickens. We also had the surprisingly good fortune to run into Karl Zimmerer at breakfast during our very first day in Lima; he was kind enough to give us a fascinating look into his own research into the biogeography of potatoes, corn, and quinoa, which set the stage magnificently for our time in the Andes. Field work in the Andes involved putting our students into 4 sampling teams, each entrusted with a methane chamber (basically a capped two foot high section of 8 inch PVC pipe) and assorted sampling paraphenalia. We are working to characterize the carbon sequestration of bofedales (high altitude non-Sphagnum peat bogs). We measure the carbon sequestration potential by taking sediment cores, and measure the methane emissions so that we can determine the overall carbon storage (theoretically, wetlands are good at carbon storage in the sediment/soil because material decomposes much more slowly in wet environments, but these same wet conditions also increase the likelihood that they produce methane, which is a greenhouse gas 25x as potent as CO2; hence, you need to measure both to assess whether the environment is an overall carbon sink or source). The technique is a bit complicated (you are taking gas samples with a syringe from the chamber and transferring them to small vials), but the students do a great and careful job. The most difficult part of the field work is the hike down to the site and back up; what would be challenging in Pennsylvania or Denver is simply exhausting at 15,000 ft. But the scenery is astounding. It’s been described as, “being on the roof of the world”, and that is how it feels and looks. The glacier is above you, alpacas dot the steep slopes, and you are on this carpet of green and water that stretches down the valley for a kilometer or more. But it is also humbling and daunting. Usually about a quarter of the students experience symptoms of altitude sickness for a day or more that rise above the level of a slight headache. For twenty-year olds that have never been incapacitated by something as random as altitude sickness (it is individual physiology, not level of fitness), it is an emotional challenge (and so begin the life lessons). The Lodge that we stay at is pleasant, though, and the lack of central heating means that everyone ends up around the fireplace in the evenings in the gathering room, bundled in blankets while we have class. Thanks to a pico projector and my ipad, there is powerpoint in the High Andes (gasp). The students have commandeered the projector and the wifi for keeping us all up to date concerning Game of Thrones, so it’s had multiple benefits! One aspect of this course that is both enriching as well as fun for us is the collection of “guests” that visit the group each with their own speciality and research interests. In Lima, Kristell, from the Center for International Forestry, is working on understanding carbon storage in Palm Swamps in Northern Peru; Jorge a professor of forestry, leads a MS in ecotourism major, and spoke of issues associated with tourism in Peru. In Cusco, Padre Luis (a Jesuit priest) and 2 colleagues talked about a variety of community projects in rural highland areas, each related to responses to climate change (e.g., biogas generation and solar panels). We have a few more scheduled for later in the trip. We were all anxious to descend, and so everyone boarded the bus yesterday rather cheerily for an 8 hour ride down the InterOceanic Highway. The Highway was just completed in 2011, running from the Atlantic coast of Brazil to the Pacific coast of Peru, intended to facilitate the transport of soybeans from Brazil to Asian markets. It is an engineering feat (crossing the Andes and topping out at 15,500 ft), and our 8 hour road trip took us from glaciers, through cloud forest, to Amazonian headwaters, dropping more than 14 of the 15,000 feet in this time span. I suggested to the students that some music might make the trip go faster, and so they constructed a 135-song playlist. And so we watched ecosystems go by to the tunes of Tom Petty, Goo Goo Dolls, Billy Joel, Michael Jackson, Maroon5, with some rap and C&W thrown in for good measure. It’s amazing how much of the playlist was from the ’70s and ’80s, making Joe and I feel somewhat at home. At least we knew the words to much of it. We are now on our way up the Rio Madre de Dios (translation: River of the Mother of God), to the Los Amigos Research Station. We are in the rainforest, in one of the most biologically diverse spots on the planet. We travel in a long, outboard “canoe”, just a long, narrow boat with rows of seats on each gunwale, holding about 20 people. Boat time is some of my favorite time, which is advantageous because today‘s ride is 5 hours long. We are going upriver, the river is wide and brown and full of sediment; the driver is quite skilled at avoiding the downed trees along the way, both visible and submerged. There is quite a bit of alluvial gold mining along the banks, small operations leaving behind conical piles of rocks and gravels and mercury in the sediments and fish. This is a major environmental challenge for Peru, and it is a complicated social and economic issue, as well. We will talk about it a lot as a class, as well as the other livelihoods such as ecotourism. Boat time is also a great time for relaxed natural history observation; for Joe and I it’s a refresher course, for our students it can be a bit overwhleming (a thousand shades of green). Joe and I are trying to remember the group of trees that we learn each year and promptly forget once back in Pennsylvania. More about our project and the rainforest later; we will be at a series of eco-lodges after our stay at Los Amigos. We are all well and grateful for the experience, but missing our family and friends as we go. Cheers! 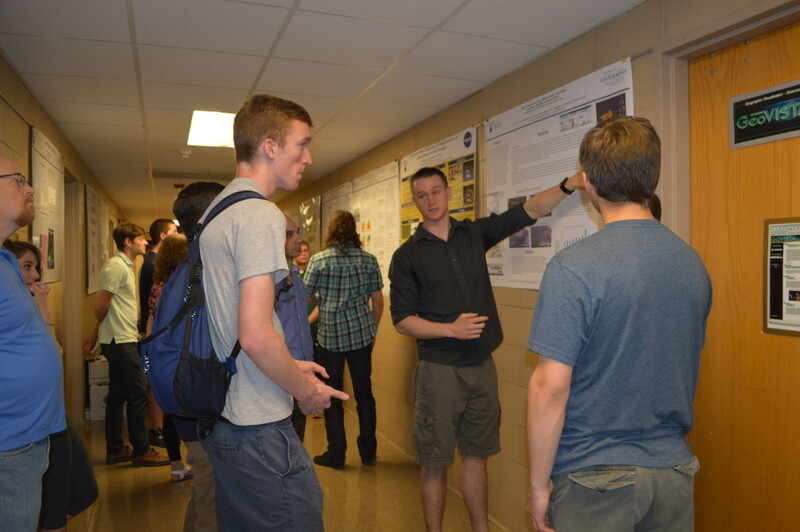 Students in Guido Cervone’s 497F, Advanced Remote Sensing, participate in a mini poster session for their final requirement for the class. Rachel Passmore (B.S. ’14) recently completed her nine-month Fulbright-Nehru English Teaching Assistantship (New Delhi, India) and on June 12, 2015, she will be departing for the Eastern Caribbean for 27 months to work on a literacy project with the United States Peace Corps. Congratulations to our colleague Melissa Wright! She has been appointed as Head of the Department of Women’s, Gender, and Sexuality Studies at Penn State. May 21, 2015—Hello everybody! I’m happy to say that we as a class have safely made it to the town of Ocongate where we will be staying at a hotel called Hotel Ausangate Lodge for a total of four nights. 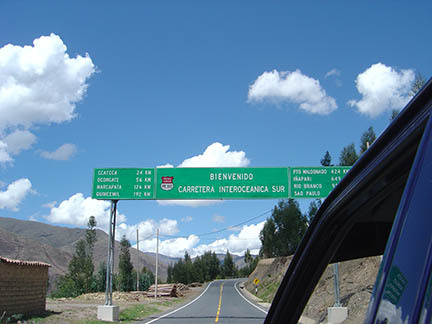 This morning we left the city of Cusco and started our trek on the InterOceanic Highway across Peru. We visited an Inca ruins site at Tipon where the Inca’s specialized in a spring fed water irrigation system which irrigated several different terraces. This was an important Incan experimental system for farming different types of crops. After we left Tipon we stopped at a small restaurant where everyone tried roasted guinea pig and the class had mixed feelings about the taste. Next on our journey for the day we visited the Cuyuni Community which is located approximately 13000 feet in elevation. Here we were able to witness how these people lived and farmed in the high Andes Mountain Range. Afterwards the Cuyuni people served us a tasty lunch which was enjoyed by all. This was a great cultural experience. Tomorrow and the day after we will begin to do field work and research on the wetlands called Bofedales. This wetland system is high in the Andes Mountains where we will be at an elevation of 15,502 feet the highest point of the trip. We will be measuring the amount of methane released from the soil (peat) in this wetland system. This is going to be a great opportunity as a class to gain knowledge about the wetlands and also obtain experience in field work study. On an end note everybody here is having a great time getting to know each other and working together as a group. The College of Earth and Mineral Science (EMS) hosted its annual Wilson Awards Banquet on April 26. Dean William Easterling presented more than 50 awards to students and fellow faculty. During the summer of 2015, Penn State researchers are partnering with the National Center for Atmospheric Research (NCAR) to investigate a major obstacle facing renewable energy — uncertainty in energy production due to atmospheric conditions like cloud cover or wind speed. The team, led by Guido Cervone, associate professor of geography and associate director of the Penn State Institute for CyberScience, seeks to develop new algorithms that better predict the amount of energy produced by solar and wind sources. Their goal is to increase the use of renewable energy on a daily basis and reduce costs. Robert E. Keane, Donald McKenzie, Donald A. Falk, Erica A.H. Smithwick, Carol Miller, Lara-Karena B. Kellogg, “Representing climate, disturbance, and vegetation interactions in landscape models,” Ecological Modelling, Volumes 309–310, 10–24 August 2015, Pages 33-47, ISSN 0304-3800, http://dx.doi.org/10.1016/j.ecolmodel.2015.04.009. The prospect of rapidly changing climates over the next century calls for methods to predict their effects on myriad, interactive ecosystem processes. Spatially explicit models that simulate ecosystem dynamics at fine (plant, stand) to coarse (regional, global) scales are indispensable tools for meeting this challenge under a variety of possible futures. A special class of these models, called landscape models (LMs), simulates dynamics at intermediate scales where many critical ecosystem processes interact. The complicated dependencies among climate, disturbance, and vegetation present a difficult challenge for LMs, however, because their simulation must reconcile processes and their interactions that occur at different spatial and temporal scales. In the absence of these interactions, key thresholds in ecosystem responses to changes in climate may go undetected or misrepresented. Send your answer and/or a photo of your dog to geography@psu.edu for our mystery dog of the week! Make way for ducklings. A mother duck watches over her brood on the lawn by the Allen Street mall on University Park campus. Kat Nickola (B.S.’00) was recently the featured author in the yearly Destination Paradise magazine published by the Stars and Stripes. Kat is a regular travel writer for the Stripes Pacific regional bi-monthly newspapers for American military members overseas. Students, faculty, staff, and friends of the Department of Geography gathered on Friday, May 1, 2015 at The Nittany Lion Inn for the annual Recognition Reception to give awards and honor achievements for the year. Contrail statistical prediction methods are often location specific. To take advantage of the fact that the upper-troposphere (UT) meteorological conditions favoring “clear-sky outbreaks” of persisting contrails, or Contrail Favored Areas (CFAs), tend to be synoptic in scale, we develop and test a visual UT map technique to hindcast CFAs for sub-regions of the contiguous United States (CONUS) having high outbreak frequencies in mid-season months (January, April, July, October) of 2000-02. This article develops a “polymorphic” approach to policy analysis, that is, an approach that draws on multiple forms of spatial reasoning. Specifically, the proposed framework deploys scale and network not merely as epistemological devices that make sense of “horizontal” and “vertical” politico-institutional structures, but as co-constitutive ontological processes that involve an ever-shifting interplay among legacies, rhythms, and events. This polymorphic approach, we argue, facilitates the identification and the examination of the mobilization of social networks and of the attendant cross-scalar interactions that must be articulated whenever a given policy is framed as a sensible and politically viable place-based solution. The history of K–12 geography education has been characterized by recurrent high hopes and dashed expectations. There have, however, been moments when the trajectory of geography education might have changed to offer students the opportunity to develop a thorough working knowledge of geography. Lucy Sprague Mitchell’s geography program developed in the 1920s and 1930s was brilliant in its conception and execution but it did not lead to large-scale systemic change. Among the most pressing research and development challenges facing geovisual analytics is the establishment of a science of interaction to inform the design of visual interfaces to computational methods. The most promising work on interaction to date has attempted to identify and articulate the fundamental interaction primitives that define the complete design space for the user experience. In this paper, we take the logical next step beyond this prior research, reporting on a controlled interaction study to learn how variation in interaction primitive combinations impacts broader interaction strategies (i.e., to learn how interaction primitives relate for both design and use). Buruli ulcer, an emerging disease caused by Mycobacterium ulcerans, largely affects poor rural populations in tropical countries. The environmental niche that supports this necrotizing bacterium is unclear. Here, water samples were collected from five communities within Ghana in the rainy season in 2011: four in the southern part of Ghana (three disease-endemic communities: Pokukrom, Betenase, and Ayanfuri, and one control: Kedadwen) and one non-endemic community (Nangruma) in the north. The extreme social–ecological diversity and human use of tropical mountains has led to the development of complex and globally influential models of humanized landscapes. At the same time, such regions are increasingly subject to challenges from new global socioeconomic and environmental changes. This study investigates the role of landscape models amid new social–ecological challenges in the Andes of western South America. Last week’s mystery dog was Milo, companion to Jenny Mason. Carolyn Fish was the first to provide the correct answer. 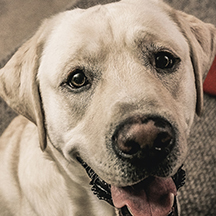 Send a photo of your dog (or any animal companion) to geography@psu.edu for our mystery dog of the week! 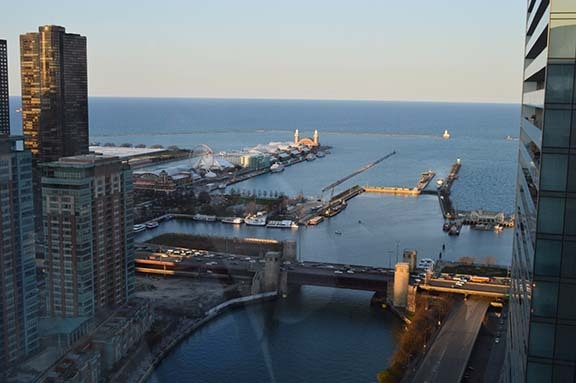 View of the Chicago River as it enters Lake Michigan by the Navy Pier from penthouse of the Swissotel in Chicago. Carolynne Hultquist accepted the NSF funded Big Data Social Science IGERT traineeship. Jase Bernhardt was awarded a University Office of Global Programs Graduate Travel Grant, for travel to London, England, this summer to present a paper on historical climatology. Andrew Carleton is lead author on the article “Sub-region-scale hindcasting of contrail outbreaks, utilizing their synoptic climatology,” just accepted for publication in the American Meteorological Society’s Journal of Applied Meteorology and Climatology. Co-authors on the article are 3 PSU Geography current and former graduate students Jase Bernhardt, Justin VanderBerg, and Armand Silva, as well as David Travis of the University of Wisconsin–Whitewater. Newly elected SWIG officers for next year: Carolyn Fish, Sam Stehle, Karen Paiva Henrique, and Nari Senanayake. Undergraduate William Chittester is president of the Model Railroad Club. Jase Bernhardt is now ABD; he passed his Ph.D. comprehensive exams. A few years ago, The Department of Geography’s newest faculty member, Clio Andris, wondered if location was related to bipartisan cooperation in the U.S. House of Representatives. “I was really interested in seeing if there were regional ties that existed, if we could find a coalition of some sort between Democrat and Republican representatives from certain states or regions. For instance, if they shared a common boundary or physical feature, like a river, maybe they would go across party lines to agree on certain things,” Andris explained. In high school, Courtney Jackson loved science and entered as many science fairs as she could find. When her mother suggested that she sign up for a fair that was only open to American Indian students, Jackson was surprised. After working and teaching for more than 30 years in geospatial intelligence (GEOINT), Todd Bacastow, professor of practice in the College of Earth and Mineral Sciences’ John A. Dutton e-Education Institute, recognized that crucial elements were missing to advance the field beyond its current limits. Penn State programs rank among the top 200 institutions worldwide in 31 out of 36 academic disciplines reviewed by the 2015 QS World University Rankings by Subject, released April 29. In addition, Penn State ranks in the top 50 in the world in eight subject areas: 28 in materials science; 31 in agriculture and forestry; 32 in education; 32 in geography; 36 in earth and marine sciences; 38 in mechanical, aeronautical and manufacturing engineering; 44 in communication and media studies; and 47 in statistics and operational research.